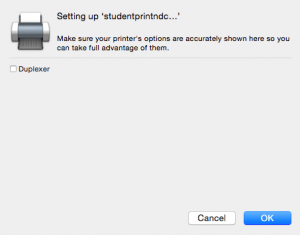 IMPORTANT: You must complete the following two steps below before you install a College printer on your Mac. Refer to the Install PaperCut on your Mac webpage to install PaperCut print management software. 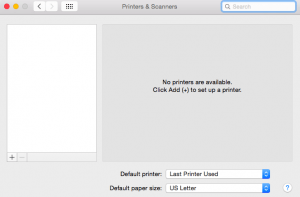 PaperCut allows you to install, access, and use College networked printers on your personal Mac. NOTE: For Windows and Android users, refer to the Install College printer on your device webpage. To find available printers for your Campus on the printer server, click the Apple icon on the top left‑hand side of your screen. 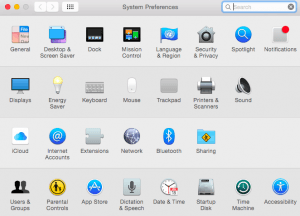 On the submenu, click System Preferences. Click the + symbol on the left‑hand side. For Notre Dame Campus printers, use studentprintndc. For Exchange District Campus printers, use studentprintedc. Protocol: Choose Line Printer Daemon – LPD. 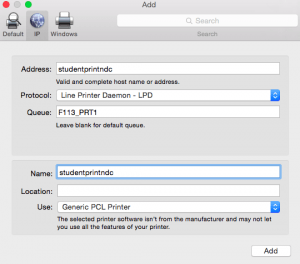 Queue: Choose the academic lab where you would like to print, this example shows the queue code as F113_PRT1. This example is an academic lab located at the Notre Dame Campus, Building F, in Room 113. Name: The address as above will default in, but you may choose to name it something else, for example the lab room number. Driver: You can choose either Generic PostScript Printer or Generic PCL Printer. Either choice will provide you with most of your printing needs. On the Setting up window, click OK.